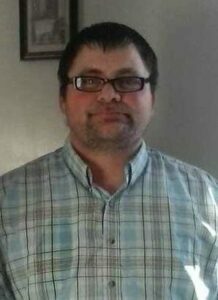 LIVERMORE FALLS - Thomas Anthony Bender, 38, a resident of Livermore Falls, passed away unexpectedly Friday, Feb. 1, 2019, at his residence. LIVERMORE FALLS – Thomas Anthony Bender, 38, a resident of Livermore Falls, passed away unexpectedly Friday, Feb. 1, 2019, at his residence. He was born May 19, 1980 in Redwood City, Calif., the son of Thomas Wallace Bender and Linda (Lenz) Hanna. He attended school in California and Maine after moving here in 1991. He worked as a flagger on construction. He enjoyed the outdoors and spending time with his family. He is survived by his father, Thomas W. Bender of Lisbon, his mother, Linda Lenz-Hanna; longtime companion, Mary Jordan; his daughters, Destiny Rose Bender and Jasmine Marie Bender all of Livermore Falls; his brother, Jeremy Alan Bender of Calif., and Jennifer Pauline Boren of Farmington.